If you were teaching a graduate seminar in public policy and challenged your students to come up with the most difficult possible problem to solve, they'd come up with something very much like climate change. It's slow-acting. It's essentially invisible. It's expensive to address. It has a huge number of very rich special interests arrayed against doing anything about it. It requires international action that pits rich countries against poor ones. And it has a lot of momentum: you have to take action now, before its effects are serious, because today's greenhouse gases will cause climate change tomorrow no matter what we do in thirty years. I have to confess that I find myself feeling the same way Andy does more and more often these days. It's really hard to envision any way that we're going to seriously cut back on greenhouse gas emissions until the effects of climate change become obvious, and by then it will be too late. I recognize how defeatist this is, and perhaps the proliferation of extreme weather events like Sandy will help turn the tide. But it hasn't so far, and given the unlikelihood of large-scale global action on climate change, adaptation seems more appealing all the time. For the same reason, so does continued research into geoengineering as a last-resort backup plan. These aren't the latest and greatest, but the exact details don't matter to understand the overall shape of the problem. The charts run from 1900 to 2100 - so the present is roughly in the middle. At the top are three paths for CO2 - growing from its pre-industrial value of about 280ppm through values up over 800ppm in the case of the A2 scenario, and stabilizing in the mid 500s by century end in the case of B1. Note that we are currently up to about 394ppm (seasonally adjusted) and still climbing fast. You can imagine better scenarios, but bear with me a minute. The three scenarios above at least represent a huge range in how well humanity responds to the problem. 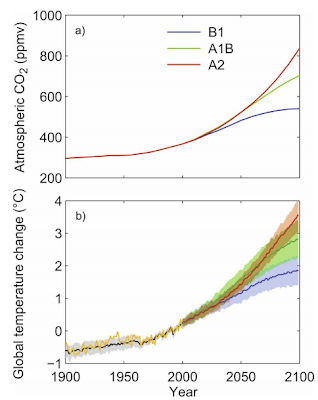 If you now look at the resulting temperature projections in the lower panel, two things become evident: 1) there's almost no difference at all in the temperature path in the next few decades based on emissions trajectory, and 2) by century end, it makes a really big difference in the total temperature change. So, firstly, it seems to me that we have no choice at all but to do quite a bit of adaptation. There's already been enough climate change to make a noticeable difference in the weather - bigger, nastier heat-waves and droughts, more precipitation extremes, etc. Given that we've got a bit less than a degree Celsius of temperature rise so far, we can be confident we are going to get at least another degree pretty much regardless of what we do. There seems very little doubt that that's going to be enough to finish melting the north pole in summer, cause some pretty profound changes in northern hemisphere weather, greatly increase droughts and downpours, etc. Sea level is going to rise, and the rate of rise is going to accelerate. So, coastal communities all over the world are going to have to look at what happened to New Orleans a few years back, or what just happened to Manhattan, and realize that the odds of those kinds of events are just going to get higher and higher as we steadily add more and more inches to the sea level and more degrees to the ocean surface temperature with the passing decades. No responsible community can afford not to plan for that and put in place the levees and sea walls and pumps and plans that are implied. Similarly, farmers and agricultural suppliers and financiers are going to have to adapt to a world in which the weather is wilder and thus crop yields in any given location are less certain and more work needs to be done to bring forth the necessary total harvest to feed the world's growing population. Some places are going to have to be abandoned, and others are going to have to be opened up to agriculture. So to say "we must adapt to some climate change" is not at all to imply "so we might as well give up the struggle". There are still huge differences between the end states that are realistically available to us as a society. It can be discouraging to think, "political change is infeasible right now and anyway will take decades to make much difference". While it's true that comprehensive political change is infeasible right now (at least in the US) I argue that it's unlikely to stay true. People may not be as quick as we'd like to respond to serious threats, but I don't have so little faith in humanity as to think that they are capable of almost literally turning the planet into something closely approximating hell in the summer. By the point - which is coming sometime this century - when we are having massive scorching droughts left and right and food prices are seriously volatile and keeping the body politic from rioting is a major pre-occupation - I'm confident that climate denial will be over and we'll be making all serious efforts to control our carbon emissions and first stabilize the CO2 concentration and then actually lower it. So I don't really have any doubt that we are eventually going to rein in our fossil fuel use. The question is about when, not if. energy audits, insulation, limiting air infiltration, efficient windows. installing solar panels, or wind where applicable. replacing fossil fuel powered heating systems and water heaters with minsplit or geothermal heat pumps. transitioning towards use of vido-conferencing to limit use of air travel. At the level of utilities it's going to be about building a global grid to average out the volatility of renewable energy sources. Some of these things will be greatly benefitted by technological improvements (eg I think there's a lot of room to make video-conferencing cheaper/better and we clearly need to drive down the cost of electric cars and continue to lower the cost of solar/wind). Better batteries and better utility storage options will be very helpful. There's an awful lot for inventors and entrepreneurs to be getting busy on. However, there's also an awful lot of low hanging fruit that is perfectly possible to do today. For example, it's entirely possible for a sufficiently motivated homeowner with decent credit to become carbon neutral today along the above lines. It doesn't even have to cost that much - almost all the upfront costs can be financed via the cashflow savings in future fuel use. There are a bunch of people who've done it already. There are more of us (including me) who are in the middle of the process. You, the reader, could be one of them if you so choose. And this leads into my final point on motivation. As individuals, we don't have any control over how long society as a whole will take to transition to carbon neutrality. What we do have control over is our personal moral culpability for the situation. I believe that we'll all be carbon neutral in the end, but we have the choice to be early adopters or late adopters: leaders, followers, or those finally dragged in by the police, kicking and screaming. This is true at the level of households, and it's doubly true for business and organization leaders who have the potential to make decisions that influence far more carbon emissions. And of course, for public intellectuals like Kevin, there is a tremendous amount of work to be done to lower the barrier to public action. There are scientific papers and studies to be read and explained to the public, bad journalism to be authoritatively contradicted, action measures to be evaluated and promoted, green businesses to be invested in, laws and regulations to be commented on, pseudo-scandals to be denounced, coal plants to be opposed. It's true that there isn't going to be some big sweeping cap-and-trade plan in the US this year or next. But that doesn't mean that there aren't hundreds of lesser measures that help or hinder - feed-in tariffs, on-bill recovery financing, fuel economy standards, renewable portfolio standards, blocking approvals for coal export terminals or tar-sands pipelines, the wind farm down the road. There's plenty of work to be done. And to the extent that we can succeed in lowering the costs and increasing the penetration of alternatives, and in raising the costs of fossil fuels, we move forward the day when more comprehensive legislation is possible. Again, make no error, since climate change is real and is very serious, that day is coming regardless. But human choices can make it sooner or make it later, and we each are responsible for what we choose to do to that end. We have no choice but to spend the rest of our lives in a warming climate. We do individually have a choice how much we do about that fact. And, collectively, we still have a choice about how much the climate will warm. In a near topic: Im in south NJ right now outside of Philadelphia. Populations, esp less wealthy ones, are feeling hopeless right now. They are afraid, have no electric, No ATMs, little left in food stamp debt cards, and water may not be drinkable in places. No one has any idea how much "news" these people are getting with regard to where help is coming from, where help is, and how to get it. Im gunna go in the more desperate parts of the city to try and pass the word and inform people that The navy is sending ships, w/ with helicopters. They may not be stopping in Camden, but the point is, they will hear them above, and know help *IS* coming. RIght now, who knows what they are thinking? Populations of NYC, A.C. N.J., Camden N.J. are under stress. Something that I call an "Unrest window" as population come out of the shock of the event, and become aware of the situation. I figure you get about 20hrs of calm, before learn/grasp the scale and timelines they are up against. Then, the next =120hrs after that are kinda vital for keeping order. I suspect the "mass social stress" will peak and start to decline around the 2nd of Nov as people become aware of repair/recovery timelines. And as Gov assistance Fod stamps/ect start to be deposited and ATMs and stores open to get food/water ect. But *ALL* of NJ rail is down, w/ no ETA on recovery. "NJ TRANSIT’s Rail Operations Center—the central nervous system of the railroad—is engulfed in water, which has damaged backup power supply systems, the emergency generator, and the computer system that controls the movement of trains and power supply"
The ONLY buses running in NJ right now are in the city of Camden. I spent the days leading up to the storm walking Camden's streets and riding buses talking to people (mostly homeless) about the storm, and few seemed aware at all it was coming or that power could even go out. Pure speculation on my part, but, I cant help but think that someone is nervous about Camden, and got the buses up and running there before ANYWHERE else, in effort to help people who wish to get out, get out. Off hand, and a total guess: 90%? of places buses go are closed. So, I dont know how else this gets explained, other then to help people get out a stressed out high crime, low income, urban area with little food, less money and no electric. I kept asking people I talked to if they had any water stored up, few did. I suspect this was equal in parts: due to a lack of resiliency and lack of awareness of the scale of threat that hit us. Not sure if your aware but our food banks were near empty before the storm hit. Google: "shortage food banks". Its happening across the U.S. Some of the 2008 "stimulus" went to buy food as markets crashed in 2009, that then went to food banks. The money spent, the food given, demand still there. I think we all need a greater focus on the complex nature of our modern urban area's with a focus on those most in need. I have relatives who spent the days leading up to this crisis, watching "talent shows", rather then plan ways and means to help one another after we got hit. Its not from them being thoughtless people. No one told them, that would be a smart thing to do, and a good way to help. They didn't know what else to do, besides live as they have. Now when anyone mentions the scale of stress populations are under, and the risks of that, (never mind the economic damage done) they "turtle". They just hide inside, and don't wanna hear it. I love this blog. And I respect all that your doing. But might I offer some words that we also need a more bottem up awareness as to CIKA (critical infrastructure/key assets) so that when these events happen, we ALL know the "choke points" in the logistics chain that WE can fix, or at least clear the roads so that others can fix faster, to help the people miles down the road recover faster as well. Thanks for enduring my rant. Getting started on adaptation in coastal areas will probably build the local consensus required for larger regional, national and international change. “I’m hopeful that not only will we rebuild this city and metropolitan area but use this as an opportunity to build it back smarter. There have been a series of extreme weather events. That is not a political statement; that is a factual statement. Anyone who says there is not a change in weather patterns is denying reality,” said Cuomo. “We have a new reality when it comes to these weather patterns; we have an old infrastructure, we have old systems. That is not a good combination and that is one of the lessons I will take from this, personally." Thanks for a post full of hope. It is easy to lose it hearing Mitt Romney saying “We don’t know fore sure if man is causing climate change so we won’t do anything about it, but rather increase oil, gas and coal production.” A little bit of hope can also be found in Kjell Alekletts Peeking at Peak Oil where on page 252 he states that scenarios families A1 and A2, which you show in IPCC´s diagrams, are not possible from a resource point of view. IPCC´s SRES, Special Report on Emission Scenarios), have according to Aleklett not considered resource limitations in their 40 scenarios. On the other hand, the uncertainty of the climate sensitivity for carbon dioxide is so great that high temperature increases might be possible any way. or the large summer high pressure area over Greenland which has the potential to steer North Atlantic hurricanes West instead of East? I'm a little pessimistic, because the problem is primarily social, and we are far too stupidly conservative about that sort of change (our town recently passed an ordinance regulating the form and placement of solar energy systems; there is an entire industry that will lose most of its value if it is forced to leave the carbon it owns underground). So, for example, suppose we want some form of transportation that will handle the 80% case for commuting (so not the longest commutes, not the largest carpools, not the heaviest loads -- but the common case) while consuming 98% less energy. Science fiction? No, it's a solved problem, electric velomobiles. But do I expect to see people using these things any time soon? No way in hell. Not only do we have the safety tragedy of the roadway commons (wear a ton or more of metal armor, because everyone else is wearing a ton or more of metal armor and they might hurt me), it's DIFFERENT, and if we excel at anything, it is coming up with rationalizations for why we cannot possibly change. So I am pessimistic. People will hold out for the unlikely silver bullet (for example, the e-car, as large as the car that I drive now, that charges in 10 minutes, and has a 500 mile range and am 85mph top speed) rather than what matches their demonstrated daily habits (5-15 miles back and forth to work, single occupancy vehicle, carrying at most 50 pounds of stuff). There's also the advocate's paradox; if an advocate doesn't actually do the thing that they propose (in fact, I do not own one of these velomobiles) then clearly they don't believe what they're saying; but if they DO practice what they preach, they must be some sort of unrepresentative weirdo. And speaking as a sometime advocate, sometimes you get a little tired of working not to scare the easily frightened. As the details and images of Sandy's destructive power continue to swirl in the media, it appears a campaign has surfaced - via email and even open-air protests - to force the discussion of climate change into the public eye. While I've never been a fan of strong-arming someone into believing what I believe, this does seem like a good time to bring the subject back into discussion. Credible arguments don't (or shouldn't) suggest that climate change had a direct hand in forming Sandy, but perhaps the conditions in the Atlantic were favorable for her to maintain her strength and perhaps even be steered in our direction. Sea surface temperatures are running 3 degrees above normal off the Eastern Seaboard. The overwhelming size of the Greenland Block is a direct result of unprecedented glacial/permafrost melt in the last decade. Both of those factors contributed to her size, strength and ultimate path into the Northeast. Bottom line in all this: the extremes we have seen and their overall frequency across the globe cannot be explained by normal climate variation. Coupled with the loss of ice and warming arctic, the evidence is overwhelming. Now full disclosure: I am on the American Meteorological Society's (AMS) Committee to Improve Climate Change Communication (CICCC). The committee's main goal is just as its title states, to bring opposing sides together for healthy discourse and RE[S]PECTFUL dialogue. A recent study of our peers (http://blog.ametsoc.org/columnists/ams-members-surveyed-on-climate-change/) shows that attitudes are changing about climate change. Too many times, I have been to weather conferences where open debate turns to personal insult. I hope this committee will help to change that. And while I am by no means an expert on climate change, I also hope to learn more and honestly reflect the views of those working in the field (doing ice core samples in very inhospitable environments) and the AMS. 1.) rapid and extensive Arctic ice melt is believed to be strengthening the Greenland high and "block"
3.) Numbers 1 and 2 may have contributed to Sandy's destructive power. I also find his increased urgency to speak out as a professional meteorologist on this issue, all while admitting pressure to remain silent, to be somewhat indicative of a small, but detectable change in society's perception and acceptance of anthropomorphic climate forcing in the literal wake of Hurricane Sandy. I'm beginning to think that the tipping point of public acceptance of said anthropomorphic climate forcing might not be as far away as many might have thought. At the level of a nation, and in a pure survival selfish sense with respect to resource constraints aspects, it would be about putting serious volume based taxes on fossile fuels (and lowering taxes on work in parallel for instance). But that today and especially in the US, it is totally impossible to talk about realistic policies, apart from never ending talks about "solutions", appears indeed to be the case. Nature magazine: End of DESERTEC? I think one of the issues has been that the policy discussion surrounding climate change has been stuck in a rut, with two and only two options discussed incessantly: a carbon tax and cap and trade. Neither has a chance of passing in the U.S. in the near-term due to its structure. I hope Kevin Drum (and the few on the other end of the political spectrum who care about climate action) will explore and discuss other policies such as the Clean Energy Dividend (originally proposed by Hansen, reframed by Dan Miller). While it too has some issues, it has the benefit of being 1) simple and 2) something that can be sold to the public. With respect I do not think you understand the problem. Suggest you study the work of Timothy Garrett. He shows that the only thing that will prevent disastrous climate change is a crash of the global economy. The physics and math show there is no alternative. I glanced at the page you reference but it doesn't seem interesting. I find the assumption that accumulated wealth must be proportional to current energy use implausible and unmotivated as a fundamental law. I assume the observed regularity in recent decades is an accident of other things canceling. What we know for sure is that wealth production per unit energy is improving and I see no reason that wealth production per unit carbon emissions cannot improve much faster in future if/when we can scale renewables to a more material fraction of global energy use. I'm of the view that it's better to focus at this early stage on subsidizing renewables rather than charging carbon producers for their externalities. Either approach can be used to even up the odds but the former is a lot less economically damaging and therefore a lot easier politically. Major carbon taxation can come later after alternatives have scaled much further. (Not to say I'm not supportive of activism to try to prevent individual coal/etc projects - I am). Lars-Eric: I've never found that line of reasoning at all plausible. The total resource of not-great-but-ultimately-usable crustal carbon is undoubtedly massive: coal (including so-so seams and the unbelievable quantities underwater eg in the north sea), tar sands, Orinoco, etc. I see no reason for your belief that we're at an "early stage". Your models as I mentioned above were off by decades about the timing of the loss of Arctic ice. They also don't tell us anything about how much methane release to expect from permafrost and hydrates under the sea. It may be a lot later than you think. This of course affects the politics of climate change, since it's going to be impossible to persuade Americans to make costly changes without some evidence that the climate will be stabilized as result. This is an elephant in the room that climate scientist don't like to talk about. And we also need to convince the Chinese, Brazilians, Indians, etc. without whose cooperation any efforts that the U.S. makes will be wasted. This is unlikely under any circumstances, even if we did have good models. Poor countries are unlikely to agree to anything which might slow their growth (or at most make token changes to shut us up), since rich countries have already added so much carbon (and other pollutants) to the atmosphere. You want to "avoid defeatism"? Well, I want to deal with reality. I don't see a movement towards "electric velomobiles" (as a previous poster suggested). What I do see when I look around is Deepwater Horizon, Fukushima, hydraulic fracking, and tar sands. Our civilization is doubling down on the bet we made after World War 2, collateral damage to the planet be damned. accumulated wealth must be proportional to current energy use implausible and unmotivated as a fundamental law. I assume the observed regularity in recent decades is an accident of other things canceling. And more specifically on climate, I think we've already buggered the system such that methane releases from the Arctic, continental shelves and permafrost are going to overwhelm any token effort human society might make to curb CO2 emissions. Hope I'm wrong, but I don't think I am. On your two last answers to barath and Lars-Eric, you clearly have it wrong on both counts for me. 2) Volume based taxes on fossile considering the starting point are clearly the best policies these days considering the starting point, if managing the turn is at all possible. And one could remove taxes on work in parallel. (plus I don't see why relating these taxes to "externalities", we know they are there, you don't do it for renewables, it is just a matteer of how hard one in willing to push in accelerating transformation). It also of course doesn't mean that some redistribution doesn't occur through other mechanism. @fred flinstone - I'm the velomobile-proposing guy, and I'm not sure how you read "But do I expect to see people using these things any time soon? No way in hell" to be optimism. We have a social and a marketing problem. We could substantially downscale our energy consumption with little actual sacrifice, but convincing naturally people that this is the case (especially with the organized and well-funded opposition of the carbon industry) is a brutally hard problem. In some sense I don't worry about China and India, because I know that serious action by us is a *necessary* condition to get them to move. It may be not *sufficient*, but it is necessary. If we demand that they take the first move, there will be no first move.